If I could turn back time, or… Why I wish I could go back to Leigh Delamere Motorway Services and introduce Sue Perkins to Virginia Woolf. On Saturday, I travelled back to Wales with my family after a week’s worth of fun and sunshine in Cyprus. 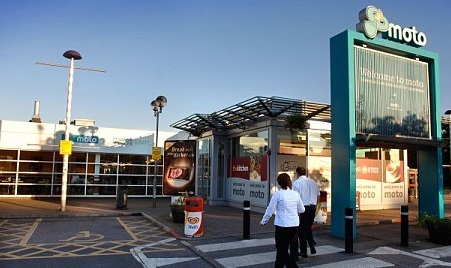 After landing in Stansted, the silent one did the first driving stint, and around lunchtime we pulled into the Leigh Delamere Services on the M4, to swap over. 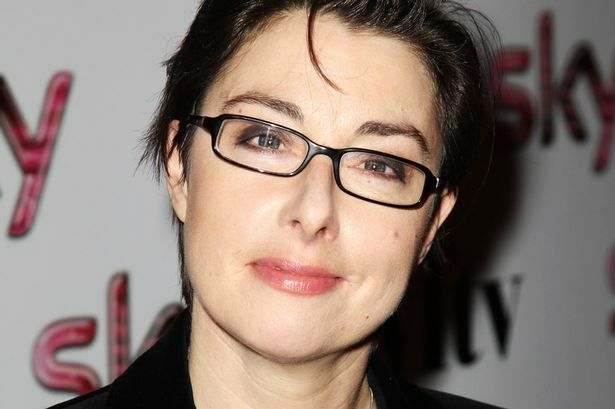 I was blinking away the tiredness under the brash flickering strip lights above the ladies’ toilet washbasins, when who should step out from the next cubicle but the magnificent Sue Perkins, looking resplendent with devilishly stylish scruffy hair, a sumptuous parka and dark-framed specs, like a cross between a well-heeled, geeky teen and a highly intelligent squirrel. How utterly fabulous! I love Sue Perkins. I’ve been a huge fan since the early ‘Mel and Sue’ days, and really enjoy her razor-sharp brilliance on Radio 4. (We’ve only just bought a telly after 10 years of being without, so I hate to say it, but I’ve never seen the Bake-Off. It’s been strange living in a Bake-Off world without knowing what the hell all the fuss is about. Cakes, pies, bread, I get it, but to be honest, Mary Berry scares me. I’ve only ever seen pictures of her, but if an image of a woman could scream ‘I have a secret devotional bat-cave in my house, filled with altars laden with an abundance of devotional kitsch in the honour and worship of the People’s Princess, our Lady Diana, tended by subscribers of the ‘Tatler’ and ‘Reader’s Digest” the image of Mary Berry does, and I’m not sure the pay-off of lighter fluffier pastry is worth the nightmares that triggers). But I digress…. Sue Perkins is one of only a few comedians whose work I find consistently clever and funny, so to suddenly see her pop up before me like a genius comedy pixie put me in a terrible quandary. Should I approach my comedy idol and attempt gratitude platitudes, or respect her right to comfort-stop privacy and do nothing? After spending years living in Brighton, a town – nay, City, which is so throbbing with celebrities, that they make local residents take courses in how to over-come the urge to stare at well-known faces lest they offend the rich and famous with their eyes, I just walked away. I locked my eyes onto the display case of Krispy Kreme Konfections and tried to guess the collective years of shelf-life it contained, while trying to look normal as I waited for the silent one to emerge with more caffeine for the journey. When I got back to the car, I was already wracked with regret. In the intervening minutes, it had dawned on me that comedy genius Sue Perkins was also a big reader. I’m sure I heard her on a book show saying her favourite book was ‘War and Peace’, and maybe she’d have found it entertaining to be introduced to the mini knitted Virginia Woolf and Charles Dickens who were, at that very moment, in my bag. It’d be like a surreal motorway services-based version of ‘My ideal dinner party’ but with yarn-based participation from the already deceased. I like to think we could have talked about Proust, and I could have asked her for comedy-writing tips and how she gets the front of her hair to do that thing. When I got back to the car and said ‘You’ll never guess who I’ve just seen, Sue Perkins!’ no-one would believe me, until there she was, swinging her M&S lunch in it’s luminous green bag as she went, quite happily returning all the waves and smiles that came her way. So, Sue Perkins, if ever I happen to be passing through Leigh Delamere at the same time as you, next time, I’ll give you a wave and a smile, and if i happen to have any famous knitted authors on my person, I’ll be sure to introduce you. 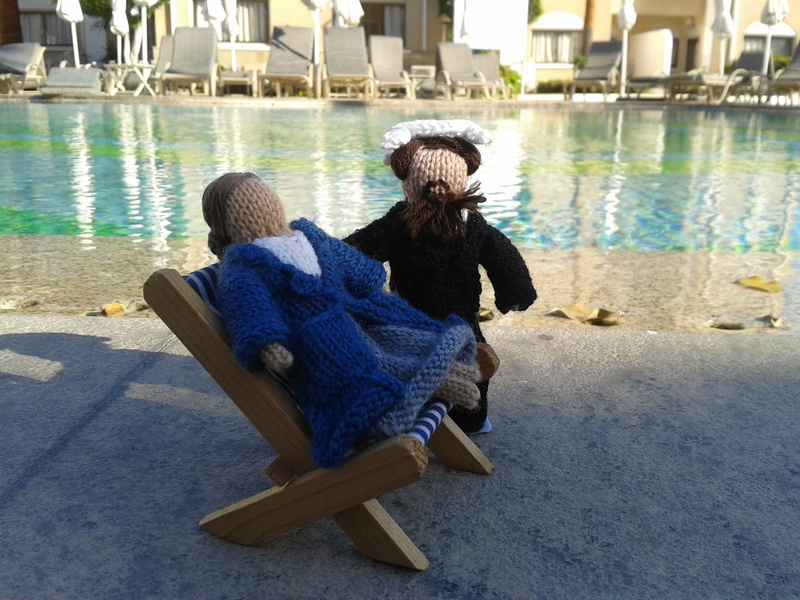 For now, here are a coupe of snaps of Virginia Woolf and Charles Dickens relaxing in Paphos, Cyprus. I thought Charles ought to wear a knotted hankie on his head as he’s going a bit thin on top. I’d have hated him to get burned. 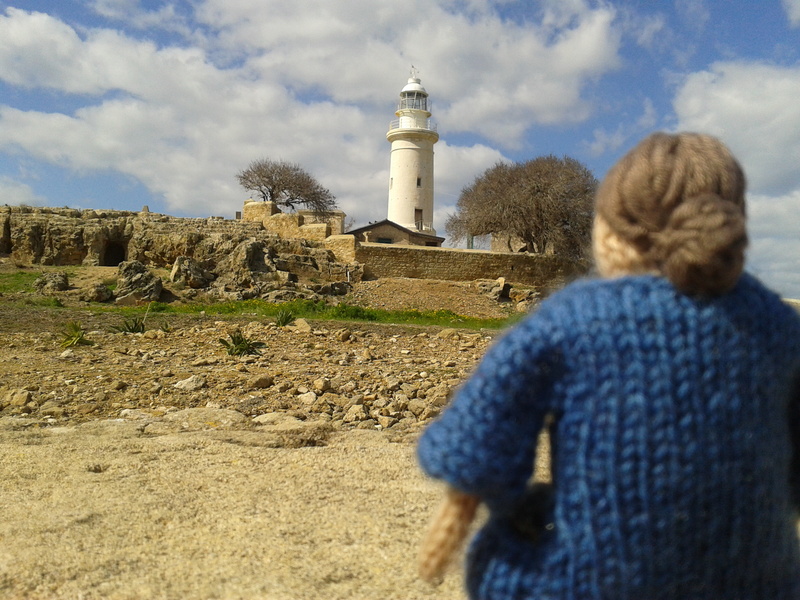 Maybe if the weather’s fine tomorrow, we can go to the Lighthouse. ← I don’t want to know.